So you think this is irony do you? You see what I did there? 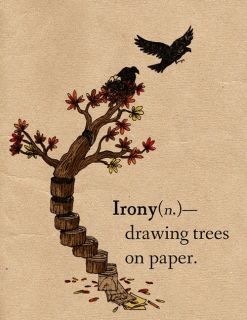 I made fun of people who think that sentence was irony. It was in fact sarcasm, because I mocked them, but I did not use irony to do so. Sarcasm is biting wit, often by using irony or understatement. So a statement that is ironic, is not always sarcastic. “I love shopping.” That is just ironic. ”I love shopping with you, you are so relaxed.” That is sarcasm, using irony. “You don’t need assertiveness training course, I have seen the way you shop.” This is sarcasm, however the intended meaning of the sentence is the same as the literal meaning, so no irony is present. We really do mean that the person is an aggressive shopper. Sadly, I like sarcasm. I find it rather hard to avoid. It is too much fun to just give up. I might need to get help. Isn’t it Ironic? Don’t you think? No, probably not. Irony is not that hard to understand, and yet so many people refer to something as ‘ironic’ or say ‘the irony of the situation’ where there is no trace of irony. Irony in literature and theatre usually involves the audience or reader having information that is not available to the character(s). This creates a tension for us as we note the character acting in a way that will have the opposite effect to what he intends, or being motivated by facts we know will be proved to be untrue. In Othello and Romeo and Juliet we, the audience, know that Desdemona is faithful to Othello, and that Juliet is merely sleeping. Othello and Romeo are not in possession of this truth, and thus act to cause tragedy. In both cases the irony is that they are creating a tragedy they already believe is existing. In Forrest Gump, we can see how his interaction with characters in history changed the world. Forrest Gump has no such knowledge. The irony is not that his actions are different from what he intends, but that we are aware of the effect(s) which he is not. This is dramatic irony. Another example of Irony that is relevant to fiction would be metafiction. Metafiction (also called Romantic Irony) involves reminders that the story is in fact a story. Examples would be the author, or even the characters, commenting on the fact that they are in a story, or drawing attention to plot devices. Bad luck and stupidity are not irony. William Bullock invented the rotary printing press, and then was later killed in an accident with one. This is irony, because had he not invented it, it could not have killed him. The irony relies on the fact that this was unexpected. A man who invents a new type of parachute, and dies testing it is not irony. It is bad luck. The fact that the parachute needed to be tested in a potentially life-threatening manner removes the irony. If however the inventor was walking down the street, and a random stranger fell on top of him due to a failure of the parachute to open… that would be irony. So for instance Alanis Morissette singing about “10,000 spoons, when all you need is a knife” is not ironic, just annoying. Unless of course you need a knife to open a box that happens to contain 10,000 knives. Then it would be ironic. I said at the beginning that irony was easy. I may have lied a little.